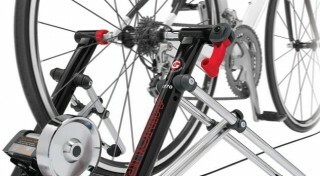 Part of the V Series of Minoura trainers, the V270 uses an advanced Magturbo neodynamic magnet brake that produces 433 and 672 Watts of power at speeds of 40 km/h and 60 km/h respectively. This advances brake offers a 35% wider resistance range over the original Magturbo brake that is found on the B60-D and B60-R trainers. 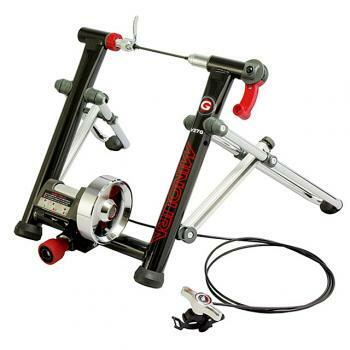 The Minoura V270 turbo trainer has a 1.1kg flywheel and provides 7 levels of resistance that is controlled via a quick release shifter that can be handlebar mounted. The V270 is compatible with the Live Training app that lets you view outputs during your workout, such as heart rate and cadence. The software is used with Apple IOS mobile devices and also allows you to workout to pre-defined training programs and view your progress with maps.